If you follow the NBA on Facebook, you might be familiar with the colossal effort being put forth since the Fall of 2014 to Save the Dairy Barn at Buhlow Lake (including the work of a high school student who made fundraising to save the barn her senior class project!). Over the past couple of years, we have watched support for rehabilitating this barn blossom – in part because they are taking the right steps to physically maintain it, but also because they have rallied their community behind the long-term goal to preserve this iconic barn. 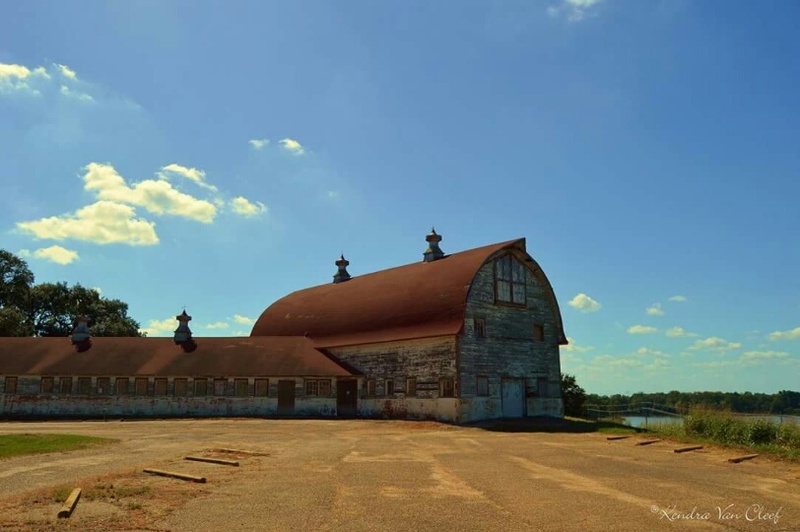 Though there is never enough money to save all of America’s great barns, outstanding examples like the Dairy Barn at Buhlow Lake clearly have the power to unite us, enrich our rural landscape, and remind us of our shared agricultural history. Our thanks to the volunteers and area residents for their work to make a big difference in their community and save that barn! In Pineville, Louisiana overlooking Buhlow Lake sits a beautiful old Dairy Barn on the property of the Central Louisiana State Hospital. The barn was built in 1923 by Joseph H. Carlin, an architect who was a former patient at the hospital who remained on staff after his successful treatment. The barn was built to supply dairy products for the hospital and many patients worked there as part of their rehabilitation. Dairy operations began in 1926 and ceased around 1956 when the pastures used for grazing cows were turned into what is now Buhlow Lake. The dairy operations moved to Grant Parish. Since then the barn has mainly been used for storage and most recently was the painting shop, although it is essentially unused today. 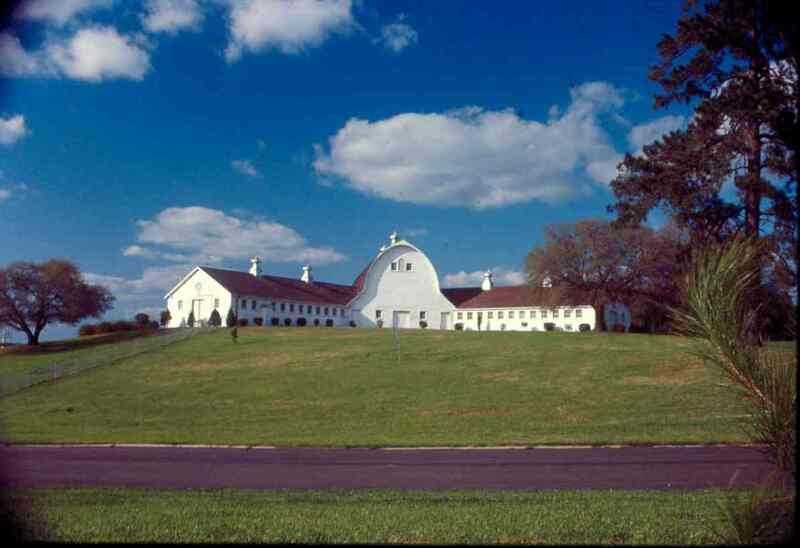 The Dairy Barn was listed on the National Register of Historic Places in 1986 and a roofing and stabilization project occurred in the mid 90s as the building was feared to be in danger of collapsing. Laminated beams were made to replace 10 of the original curved beams that support the roof, and steel tension bars were placed horizontally throughout the loft’s interior for extra reinforcement. The barn has been recognized by the Louisiana Trust for Historic Preservation as one of the most endangered sites in the state of Louisiana as early as 2009 and for 2016. In 2012 the State of Louisiana announced plans to relocate the Central Louisiana State Hospital to a new facility to be built near Pinecrest. Funding is in Priority 5, meaning the timeline is uncertain. In November of 2014, Kendra Van Cleef created the “Save the Dairy Barn at Buhlow Lake” page on Facebook. Within a week there were over 5,000 likes and currently over 10,000 likes. Many people expressed interest in this project and an informal committee was formed to explore possibilities and champion the cause of saving the barn. The barn is not in danger of being demolished; the primary concern is the deterioration due to weather and the lack of a plan for its restoration and use. A non-profit corporation has been formed which is entering a Cooperative Endeavor Agreement with the Department of Health of the State of Louisiana for a restoration project for the Dairy Barn with Save the Dairy Barn at Buhlow Lake raising funds and donating repairs. The “Save the Dairy Barn Fund” has been established with the Central Louisiana Community Foundation to provide financial accountability in receiving tax-deductible donations. If each of the thousands of people in central Louisiana and beyond (readers of The Barn Journal) donates $5 or $10 to the Save the Dairy Barn Fund, this will help finance this initial project. Now is the time! Thank you.